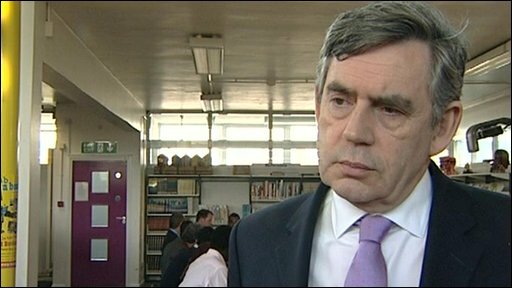 Gordon Brown: "No breach of the ministerial code"
The Parliamentary Commissioner for Standards is considering a complaint over Communities Minister Shahid Malik. It came after Gordon Brown denied he acted too quickly in bringing Mr Malik back into government, following fresh allegations about the MP's expenses. Mr Malik denies a Daily Telegraph story about claiming for two offices. The commissioner, John Lyon, said he was considering the complaint, which was made by the Sunlight Centre for Open Politics transparency campaign. The Telegraph alleges Mr Malik claimed the maximum second home allowance on his London property while he funded his office on the ground floor of his constituency home in Dewsbury through a separate system of parliamentary office expenses. Mr Malik has described the latest story as "complete fabrication". In a brief statement, he said: "I have never claimed anything from the public purse for any living accommodation apart from that which is permissible for my second home. "I have certainly not claimed a penny from the public purse for my designated main home." Mr Brown said the communities minister was cleared by watchdog Sir Philip Mawer of breaching the ministerial code over the first set of allegations. And he would be answerable to independent auditors - like all other MPs - over any further allegations. But in a letter to Mr Lyon, Harry Cole of the Sunlight Centre, which describes itself as a "non-partisan, not-for-profit company", said there was "intense public concern about this issue". The communities minister stepped down while earlier stories about his financial arrangements were investigated by Sir Philip, who advises the prime minister on ministerial interests. Sir Philip, who cleared the minister of breaching the ministerial code over the rental arrangement for his constituency home, said in a statement that he stood by his judgement. In his report, published on Wednesday, Sir Philip said there was not enough evidence to back up the Telegraph's claim that Mr Malik had benefited from a preferential rent on his constituency home. He found that the rent he was paying was a reasonable market rate - but criticised the MP for failing to provide receipts or a tenancy agreement to back up his claims. Mr Malik had originally rented one property for £320 a month for three-and-a-half years until the end of May 2008, the report says. He then moved into the larger property next door for a monthly rent of £620. He continued to pay £320 a month in direct debit but paid the remaining £300 in cash, at the request of the property management company. Mr Malik told Sir Philip he had not thought this "unusual" or a "means of tax avoidance" as he knew the manager of the property company was a "strictly practising Muslim" who as a "matter of religious observance or a cultural norm" would have preferred to deal in cash. As a result, the report says, the MP had been unable to produce receipts or a rental agreement to back up his claims he was not renting his constituency home at a preferential rate. Sir Philip Mawer said it was "unfortunate" that Mr Malik had not been able to establish a proper audit trail to support his assertions that he had not benefitted from discount rent and that he had paid the balance of his new, higher rent in cash. After studying Mr Malik's bank statements and paperwork provided by the property company, Sir Philip concluded "it is more likely than not that these cash payments were made". But he added: "It is unfortunate, particularly given his public position, that, in respect of that house, Mr Malik did not think of obtaining at the outset a rental agreement specifying in writing the rent to be paid." Mr Malik says he has written to the prime minister to confirm that he has now put his rental arrangements in respect of the Dewsbury property on a more formal basis, with a tenancy agreement that specifies the rent to be paid. He will also be paying all of his rent in future by direct debit. Downing Street said it was up to Mr Malik himself to answer questions on the latest allegations relating to the rental of office space. The prime minister's official spokesman said: "He is not the only MP to find himself on the front page of the Daily Telegraph and I'm sure he will not be the last, but there are no new allegations he has breached the ministerial code." Mr Brown said any impropriety would be discovered by the independent auditors who are examining all claims going back four years. "Mr Malik, like every other MP, all 650 of them, will have to go through that process and if there is any difficulty or impropriety action will have to be taken," he told BBC News.